We will build the endpoint using Express, a library for creating web applications on Node.js, but it is important to understand that any type of HTTP server can be used. If you have an existing backend that needs to integrate with WeChat, you could of course implement it on the existing stack. As long as it fulfils the (simple) requirements set forth by WeChat, it will suffice. Let’s get started. The final code is on GitHub. Make sure you have the latest (or a pretty recent) Node.js and NPM installed on your machine. Install ngrok. It will be used as a secure tunnel to your machine that WeChat can access, more on that later. Install WeChat through the App Store or Google Play if you haven’t already and register an account. If you’re already on WeChat, you can skip this step. Browse to the sandbox (unfortunately, the authentication in the English edition seems to be broken, so we will use the Chinese edition). Log in by clicking the green button (登录 ‘log in’) and scanning the QR code (you can find the scanner by tapping the ‘+’ on the chat overview). Authorize the sandbox by confirming the login on your phone. logged to the terminal. Open a browser and browse to http://localhost:3000. It should show the simple message ‘WeChat endpoint’. is set as a query parameter and outputs it if it is set. Otherwise, it returns a 404 status code and error message. The logging statements will be shown in the terminal session you used to start up the Node application. call we created earlier, above the port definition. After a few seconds you should see the output from ngrok. Copy-paste the second ‘Forwarding’ URL (the https:// one) and paste it in your browser. This should connect without problems. You can open the ngrok web interface if you want (mentioned under the ‘Web Interface’ entry). to the https:// URL of ngrok and paste it in the ‘URL’ field. Then type a random string in the ‘Token’ field (like 123456, the contents don’t matter because we are not checking the signature). Click the green button (提交 ‘submit’). You probably get an error. Click the button again. You should now see a 200 OK request coming in on the ngrok dashboard, and the URL and token should be saved in the sandbox. Your account has been set up! to register a handler for POST requests. As we don’t want to write a lot of XML-parsing boilerplate code ourselves, we will install an XML body parser for Express that can handle this for us. Let’s start with that. This piece of code sets up a POST handler on the router (line 6), takes the parsed XML out of the body and switches over the message type (line 9, the XML parser puts single text nodes into an array so that’s why we need to access it with index 0). The function then forwards the response object and parsed XML to one of three handlers (line 11, 13 and 15), for handling new events, text messages and any messages of unknown type respectively. The last step will involve implementing these handlers and returning an XML response that will be sent to the user. This is the final step of implementing our WeChat echo service! As WeChat requires us to respond with XML, we will use template strings to easily create an XML string that can be written to the response object. WeChat then sends our message to the user’s device, so it feels as if they are talking to an actual person. This will inject the receiver, sender and text content into an XML string that can be sent in the handlers. You should add this function above the handlers, by replacing TODO 3.
event. It then creates an XML response by flipping the sender and receiver from the XML data and adding a string message. This will welcome new followers with the ‘Welcome to our Official Account!’ message. function, we just send back a message telling the user that our echo service does not (yet) understand what they’re saying. And that’s it! After all the hard work it is time to see what happens when we start to follow our own Official Account and send some messages. To start following yourself, scan the QR code that is shown on the WeChat sandbox page, halfway down. On your phone, tab the ‘+’ at the top-right corner in the chat overview, then tap ‘Scan QR code’. After scanning the code, you should see a simple page with a large ‘Follow’ button. If you tap that, WeChat should open a new chat with the echo service. It should welcome you with the message we added earlier. If you send a text message, the echo service should reply with your message reversed. If you send anything else (a picture maybe, or your location) the echo service will tell you that it doesn’t understand that message type. If this all works, good job! You’ve now seen how you can build a simple application on WeChat using the Official Account debug sandbox. As an exercise, you could try changing the code so the service greets the user with a menu, and based on the user’s response trigger an action like sending a video or image. The technical documentation of WeChat will help you in figuring out how to handle incoming media files and how to respond to them. Luckily, the ideas are similar to what you have seen so far. Also, you could host your Node application somewhere in the cloud so it keeps reacting to new messages. 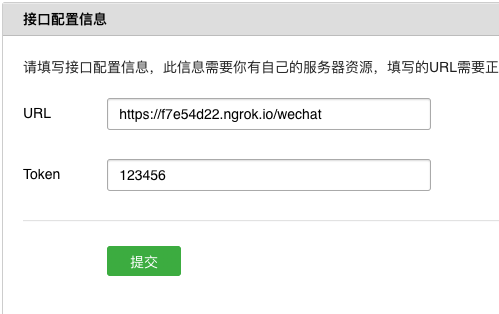 Right now, if you kill your ngrok tunnel and/or Node app, WeChat will show an error to users that sent anything to your sandbox account. You can look into tools like Zeit Now to easily deploy your Node app in a more persistent way, or try the Amazon and Google clouds for easy hosting. After setting up your application elsewhere, don’t forget to change the URL on the sandbox page. I hope the implementation of a simple echo service helped you assess whether or not WeChat is the right platform for your business and whether or not it can help you get more traction within the Chinese market. If you decide to go with WeChat, the first steps in this blog post should help you get up and running as quickly as possible. Should you inadvertently need help with the strategic or technical implementation of WeChat for your proposition on the Chinese market, please don’t hesitate to contact us! Léon Rodenburg is a full stack development consultant at Xebia. He has a background in Computer Science and Sinology and is always on the lookout for the crossroads between the two. Having lived and studied in China for quite some time, he has put his knowledge of the Chinese language into practice by experiencing on- and offline daily life in Beijing like a local.